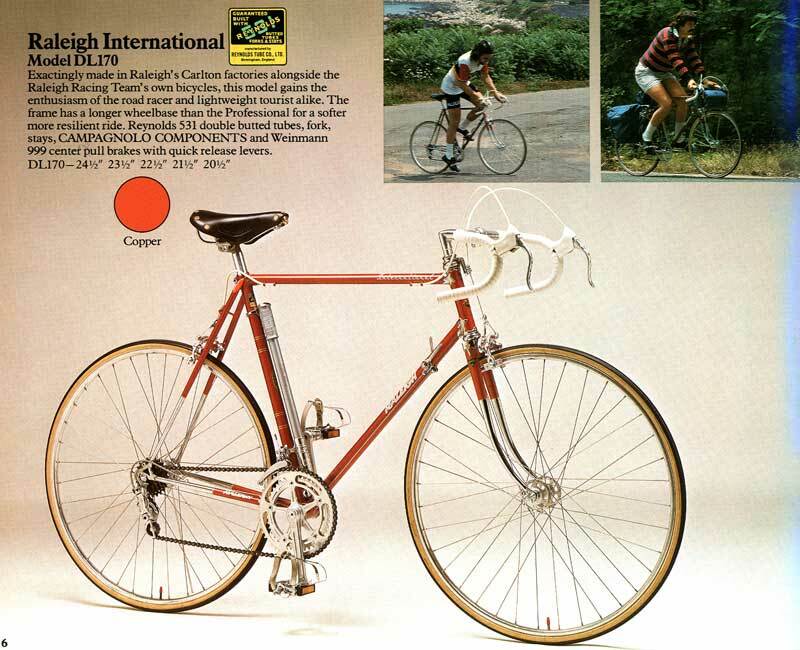 The Raleigh International was the second from the top of Raleigh's production bike line, below the Professional. 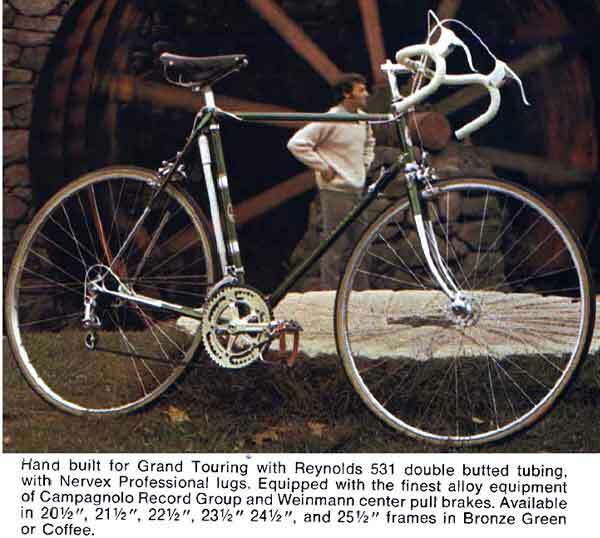 Like the Professional, it the frame was all Reynolds 531, double butted, and it came with a full Campagnolo Nuovo Record group--except for the brakes, which were Weinmann centerpulls. While the Professional was patterned after the popular Italianate style popular in the early '70s, the International harkend back to an earlier ear. The International frame was built for comfort, lightness and verastility, while the Professional was built for stiffness and maneuverability. The Internationals had very generous tire clearanbce (hence the need for the long-reach Weinmann calipers) and relaxed angles. The frames make very nice light-touring bikes, but the racing components supplied as stock, including tight 10 speed gearing and tubular tires make the stock version somewhat of an anomaly. In the late '70s, the International's design was extremely unfashionable, and many of them were "parted out" for their Campagnolo goodies. This was unfortunate, because they are a very nice ride. 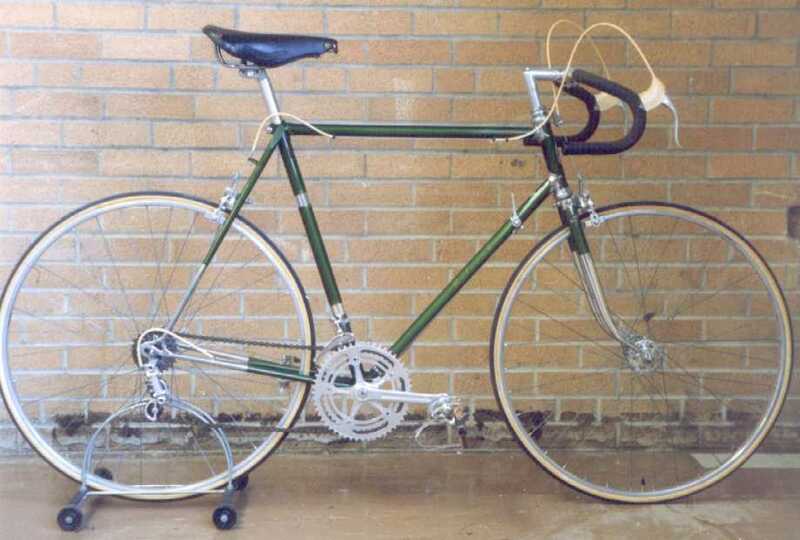 Some years featured Reynolds "Rapid Taper" chainstays, which are round in cross-section from one end to the other, but taper rapidly from the bottom bracket to the tire area for clearance. "F" serial number (though it could be an "E"...partly obscurred), Oval "anniversary" headbadge. Gold pinstripe lettering "Raleigh" on downtube, small red "International" on top-tube. Half -chrome stays and lower fork blades with chromed fork crown. 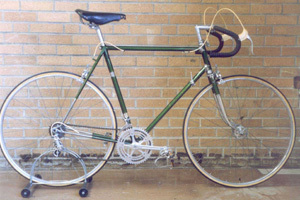 Reynolds 531. Nervex Lugs, chromed at head-tube. Semi-wrap around seat stays. Round Chainstays, no dimpling. Lugs, seat-tube, seatstays and chainstays are all pinstriped in gold. Campy dropouts with eylets. Campy NR except for Weinman centerpull brakes. Brooks Pro saddle. Small "blue ribbon" Carlton decal on seat-tube. Alloy bars with GB stem. Nothing printed on brake lever hoods. Weinmann rims. Brazed on cable guides on top tube. 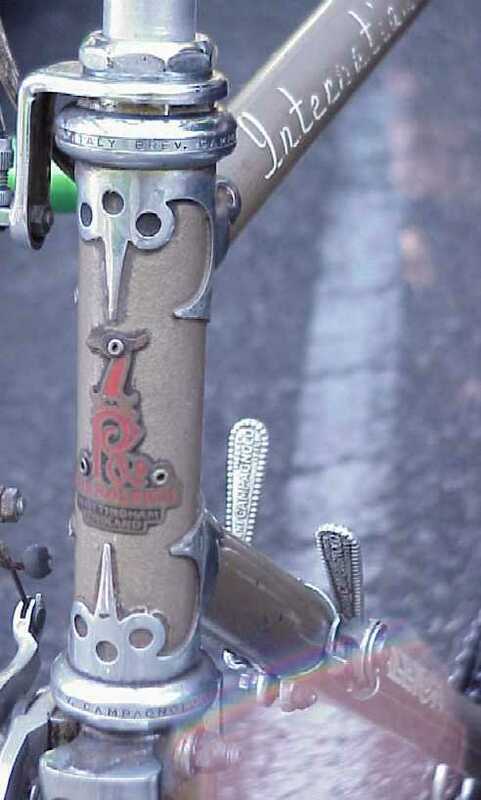 "F" serial number, Heron headbadge. Gold/brown pinstripe lettering. "Raleigh" on downtube, small red "International" decal on toptube. Half chromed stays, fork blades; fully chromed fork crown. Reynolds 531 butted throughout. Nervex Professional lugs. Semi wrap around seat stays, points almost meet. Chainstays round at BB, no dimples. Campy dropouts with eyelets front & rear. Campy NR throughout except for brakes. 52 & 45 tooth chainrings. Brooks Pro leather saddle, small rivets. Simplex 5-speed freewheel (14, 16, 18, 21, 24). Carlton red, white, & blue "guy on a bike" decal on seattube. Small Raleigh "heron" decal on fork blades. Plain alloy bars (38cm c-c) and GB stem. Weinmann centerpull brakes and quick release brake levers. Levers drilled out and with white plastic hoods with "Carlton" in the moulding. AVA? rims. 3 brazed on cable guides/stops for rear brake - 2 at front of toptube, 1 at rear. 1 brazed on cable guide/stop for rear der cable on top of right stay. Champagne colored frame does not have the epaulets on top of the fork crown (may just be particular to this bike). "WD4..." serial number, Heron headbadge. Slanted white block lettering "Raleigh" on downtube and chainstays. White pinstripe lettering "International" on toptube. Half chromed stays, fork blades; fully chromed fork crown. Reynolds 531 butted throughout. Nervex Professional lugs. Angled seat stay caps, allen head seatpost bolt. Campy dropouts with eyelets front & rear. Campy NR throughout except for brakes. 52 & 42 tooth chainrings. Brooks Pro leather saddle with 5/16" rivets. Simplex 5-speed freewheel (14, 16, 18, 21, 24). Plain alloy bars (38cm c-c) and GB stem. Weinmann centerpull brakes and quick release brake levers. Levers drilled out and with gum rubber hoods. AVA? rims. 3 brazed on cable guides/stops for rear brake - 2 at front of toptube, 1 at rear. 1 brazed on cable guide/stop for rear der cable on top of right stay. GB bars (plain) and stem with recessed allen head expander bolt. Carlton black & gold decal on seattube, triangular black, gold, & red decal at bottom of seattube. Reynolds 531 decal on each fork blade. Gold pin-stripe bands around seattube, 2 pairs of double bands above and 2 pairs below Carlton sticker. "WK4..." serial number, Heron headbadge. Slanted white block lettering "Raleigh" on downtube and chainstays. White pinstripe lettering "International" on toptube. Half chromed stays, fork blades; fully chromed fork crown. Reynolds 531 butted throughout. Nervex Professional lugs. Angled seat stay caps, allen head seatpost bolt. Campy dropouts with eyelets front & rear. Campy NR throughout except for brakes. 52 & 42 tooth chainrings. Brooks Pro leather saddle with 5/16" rivets. Simplex 5-speed freewheel (14, 16, 18, 21, 24). Plain alloy bars (38cm c-c) and GB stem. Weinmann centerpull brakes and quick release brake levers. Levers drilled out and with white plastic hoods with "Carlton" in the moulding. 4 brazed on cable guides/stops for rear brake - 2 at front of toptube, 2 at rear. 1 brazed on cable guide/stop for rear der cable on top of right stay. GB bars (plain) and stem with recessed allen head expander bolt. Carlton black & gold decal on seattube, triangular black, gold, & red decal at bottom of seattube. "Made in England" decal on top of top tube, in front of seat post. Reynolds 531 decal on each fork blade. Gold pin-stripe bands around seattube, 2 pairs of double bands above and 2 pairs below Carlton sticker. Year 1970 1974 More in the catalog archives! Frame Sizes 20.5", 21.5", 22.5", 23.5", 24.5" 20.5", 21.5", 22.5", 23.5", 24.5"
Frame Material Reynolds 531 Double Butted Tubing Reynolds 531 Butted Tubes, Forks and Stays. Campagnolo ends. Extras Pic shoes toeclips and red straps; white Silca pump mounted behind seat tube. Christophe Toeclips and Chrome Leather Straps. Silca Impero Pump.